The nature of radio and electromagnetic radiation in general. If some one said; well you're radio ham what exactly is radio? You may answer by saying that it is electro-magnetic radiation similar to light and hope that, that was a sufficient enough answer. Because this is a complex and curly question and if you investigate it you may be surprised at what is understood as being the true nature of radio and the other manifestations of electro-magnetic radiation including light. Albert Einstein was once asked to explain how radio worked, Einstein said: "You see, wire telegraph is a kind of a very, very long cat. You pull his tail in New York and his head is meowing in Los Angeles . Do you understand this? And radio operates exactly the same way: you send signals here, they receive them there. The only difference is that there is no cat." Yes; radio is regarded as being electromagnetic radiation just as light, x-rays etc are, but at a different wavelength or frequency. The wavelength refers to the spatial period of the electromagnetic wave, the distance over which the wave's shape repeats or one complete cycle. It is usually determined by the distance between consecutive corresponding points of the same phase, such as crests, troughs, or zero crossings. The frequency refers to how many complete cycles occur per second with the unit of measure of one cycle per second being 1 Hertz. The complete range of all possible frequencies or wavelengths is referred to as the electromagnetic spectrum and includes frequencies well below the lowest operational ELF (Extra Low Frequency) to Gamma radiation at the extremely shot wavelength end. 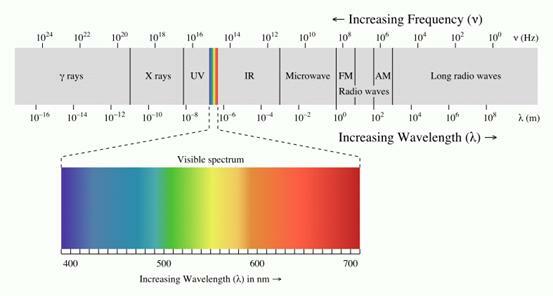 Electromagnetic radiation is defined into a number of broad groups according to the frequency of its wave; these include radio waves, microwaves, infrared radiation, visible light, ultraviolet radiation and X-rays etc. Within these broad groups there are many subgroups such as VHF (Very High Frequency), UHF (Ultra High Frequency) etc. The colour of light for example is known to be a result of its wavelength or frequency e.g. 450 nanometres or 660 Terahertz being blue. The Electromagnetic radiation takes the form of self-propagating wave in space consisting of two components an electric field and a magnetic field. According to my copy of the ARRL's handbook 2003, electromagnetic radiation or the electromagnetic wave is the interaction of an electric and a magnetic field. An oscillating electric charge in a piece of wire for example, creates an electric field and a corresponding magnetic field that in turn creates an electric field which creates another magnetic field, and so on. The two fields sustain themselves as a composite electromagnetic wave, which propagates itself into space. The electric and magnetic components are orientated at right angles to the direction of travel. The polarization of a radio wave is usually designated the same as its electric field. Unlike sound waves or ocean waves, electromagnetic wave needs no propagating medium, such as air or water. This property enables electromagnetic wave to travel through the vacuum of space. Earlier theories of electromagnetic radiation did however suggested that an unseen undetectable medium known as the Aether was needed to support the electromagnetic wave, this idea is now largely out of favor. All this implies that electromagnetic radiation is in fact a wave, however electromagnetic radiation also has in away that is near to impossible to visualise particularly for radio; a second identity, that of a particle or Photon or packet of energy. While the Photon is normally associated with light it is a feature of all electromagnetic wave radiation irrespective of the wavelength. Prior to the twentieth century science largely fell into to two distinct camps when it came to describing light for example, those that felt a particle model best described all or most of the nature of light and those that felt that a wave model best described light radiation. We had two distinctly different models for electromagnetic radiation at least as far as light was concerned; wave or particle, the particular model is applied subject to the application or observation. As science moved into the twentieth century this became more than convenient as many experiments demonstrated that both models can be shown to be valid. In 1909 a scientist named Jeffrey Taylor determined to settle the controversy by conducted a series of experiments to determine the true nature of electromagnetic radiation ultimately concluded in the end that in fact both model were valid and electromagnetic radiation had a dual identity. The apparently conflicting concept that later became known as particle/wave duality is within the realms quantum physics and well beyond anything that I can comfortably rap my head around. According to most physicists however the duality concepts is accepted as being fact for the entire electromagnetic radiation spectrum. It is thought that the photons as an elementary particle having no electric charge or resting mass are field particles that are the carriers of the electromagnetic field. If you can imagine it, this is how it is thought that the two concepts fit together. As a particle the photon is seen as a discrete bundle (or quantum) of electromagnetic energy. Photons are always in motion and have a constant speed of light to all observers. The photon known as a force carrier is categorised as a Gauge Boson and is exchanges when ever Protons and Electrons interact, it has as stated earlier no mass or charge and seems to carry just enough energy to excite a single molecule in your eye's photo receptor cell. Despite its ethereal existence the photon is were it's at; and is fundamentally involved in everything that you have or will ever do or experience. Australian physicist/writer Paul Davies said 'The idea that something can be both a wave and a particle defies imagination, but the existence of this wave-particle "duality" is not in doubt. ... It is impossible to visualise a wave-particle, so don't try'. It is however important to realize that while the particle/wave duality theory is generally accepted, there are other views including that a wave only model may be able to explain the entire observable phenomenon electromagnetic radiation. What ever the model of what radio and the other electromagnetic radiations are, will also be a model of how in fact energy and matter interact and is therefore a fundamental corner stone of our understanding of physics and a model of the very realty we all take for granted. The electrical energy generated at a particular frequency in a radio transmitter and sent up the transmission line and loaded into the antenna is something that most radio amateurs pretty much understand and are comfortable discussing and experimenting with. But, how many know how this energy transmutes from electrical energy to the more nebulous electro-magnetic radiation that is after all radio. I actually thought that I did understand it, well to a degree anyway with out having really thought about it. I think the term electro-magnetic leads me to think electricity and magnetism. I felt that I had a good working grasp of electrical and magnetic principles, so electro-magnetic radiation shouldn't be to different should it! Electric charge fields and magnetic fields can be powerful things, but are relatively undetectable at fairly modest distances unlike radio, light or other electro-magnetic radiation that can be detected after travelling across the entire universe. So electricity and magnetism do not equal electro-magnetic radiation, it is something related but different. Perhaps as a simple analogy the relationship between electricity, magnetism and electro-magnetic radiation is a bit like in chemical terms oxygen and hydrogen forming water after a suitable chemical reaction. The properties of water bare little resemblance with its constituent elements as electro-magnetic radiation differs in many ways from its fundamental components electricity and magnetism. It is interesting that while publications like the RSGB and ARRL amateur radio hand-books cove subjects like antenna principles (Electrical and Magnetic) and radio propagation principles (Electromagnetic radiation) they do not cover at all the point when one becomes the other. I begin to appreciate a comment made by a fellow radio amateur and technician that antenna theory was 15% science and 85% black magic! The reason I decided to write this article is as I said earlier I didn't even realise that I had no idea about creation of electro-magnetic radiation by my antenna. I stumbled over it a couple of years ago in a copy of the United States Navy Electricity and Electronics Training text book. The training manual's explanation of how electro-magnetic radiation is created by the antenna is covered in a non-mathematical relatively easy to follow descriptive presentation. A secret had been reviled. I'm not sure about most people, but when learn something new, something in this case I didn't even know I didn't know, it's a beautiful thing and worth sharing. The way energy is propagated into free space is a source of great dispute among people concerned with it. Although many theories have been proposed, the following theory adequately explains the phenomena and has been widely accepted. There are two basic fields associated with every antenna; an INDUCTION FIELD and a RADIATION FIELD. The field associated with the energy stored in the antenna is the induction field. This field is said to provide no part in the transmission of electromagnetic energy through free space. However, without the presence of the induction field, there would be no energy radiated. Figure 2-1, a low-frequency generator connected to an antenna, will help you understand how the induction field is produced. Let's follow the generator through one cycle of operation. Figure 2-1. - Induction field about an antenna. Initially, you can consider that the generator output is zero and that no fields exist about the antenna, as shown in view A. Now assume that the generator produces a slight potential and has the instantaneous polarity shown in view B. Because of this slight potential, the antenna capacitance acts as a short, allowing a large flow of current (I) through the antenna in the direction shown. This current flow, in turn, produces a large magnetic field about the antenna. Since the flow of current at each end of the antenna is minimum, the corresponding magnetic fields at each end of the antenna are also minimum. As time passes, charges, which oppose antenna current and produce an electrostatic field (E field), collect at each end of the antenna. Eventually, the antenna capacitance becomes fully charged and stops current flow through the antenna. Under this condition, the electrostatic field is maximum, and the magnetic field (H field) is fully collapsed, as shown in view C. As the generator potential decreases back to zero, the potential of the antenna begins to discharge. During the discharging process, the electrostatic field collapses and the direction of current flow reverses, as shown in view D. When the current again begins to flow, an associated magnetic field is generated. Eventually, the electrostatic field completely collapses, the generator potential reverses, and current is maximum, as shown in view E. As charges collect at each end of the antenna, an electrostatic field is produced and current flow decreases. This causes the magnetic field to begin collapsing. The collapsing magnetic field produces more current flow, a greater accumulation of charge, and a greater electrostatic field. The antenna gradually reaches the condition shown in view F, where current is zero and the collected charges are maximum. As the generator potential again decreases toward zero, the antenna begins to discharge and the electrostatic field begins to collapse. When the generator potential reaches zero, discharge current is maximum and the associated magnetic field is maximum. A brief time later, generator potential reverses, and the condition shown in view B recurs. NOTE: The electric field (E field) and the electrostatic field (E field) are the same. They will be used interchangeably throughout this text. Figure 2-2. - Phase relationship of induction field components. All the energy supplied to the induction field is returned to the antenna by the collapsing E and H fields. No energy from the induction field is radiated from the antenna. Therefore, the induction field is considered a local field and plays no part in the transmission of electromagnetic energy. The induction field represents only the stored energy in the antenna and is responsible only for the resonant effects that the antenna reflects to the generator. The E and H fields that are set up in the transfer of energy through space are known collectively as the radiation field. This radiation field is responsible for electromagnetic radiation from the antenna. The radiation field decreases as the distance from the antenna is increased. Because the decrease is linear, the radiation field reaches great distances from the antenna. Let's look at a half-wave antenna to illustrate how this radiation actually takes place. Simply stated, a half-wave antenna is one that has an electrical length equal to half the wavelength of the signal being transmitted. Assume, for example, that a transmitter is operating at 30 megahertz. If a half-wave antenna is used with the transmitter, the antenna's electrical length would have to be at least 16 feet long. (The formula used to compute the electrical length of an antenna will be explained in chapter 4.) When power is delivered to the half-wave antenna, both an induction field and a radiation field are set up by the fluctuating energy. At the antenna, the intensities of these fields are proportional to the amount of power delivered to the antenna from a source such as a transmitter. At a short distance from the antenna and beyond, only the radiation field exists. This radiation field is made up of an electric component and a magnetic component at right angles to each other in space and varying together in intensity. With a high-frequency generator (a transmitter) connected to the antenna, the induction field is produced as described in the previous section. However, the generator potential reverses before the electrostatic field has had time to collapse completely. The reversed generator potential neutralizes the remaining antenna charges, leaving a resultant E field in space. Figure 2-3 is a simple picture of an E field detaching itself from an antenna. (The H field will not be considered, although it is present.) In view A the voltage is maximum and the electric field has maximum intensity. The lines of force begin at the end of the antenna that is positively charged and extend to the end of the antenna that is negatively charged. Note that the outer E lines are stretched away from the inner lines. This is because of the repelling force that takes place between lines of force in the same direction. As the voltage drops (view B), the separated charges come together, and the ends of the lines move toward the center of the antenna. But, since lines of force in the same direction repel each other, the centers of the lines are still being held out. Figure 2-3. - Radiation from an antenna. As the voltage approaches zero (view B), some of the lines collapse back into the antenna. At the same time, the ends of other lines begin to come together to form a complete loop. Notice the direction of these lines of force next to the antenna in view C. At this point the voltage on the antenna is zero. As the charge starts to build up in the opposite direction (view D), electric lines of force again begin at the positive end of the antenna and stretch to the negative end of the antenna. These lines of force, being in the same direction as the sides of the closed loops next to the antenna, repel the closed loops and force them out into space at the speed of light. As these loops travel through space, they generate a magnetic field in phase with them. Since each successive E field is generated with a polarity that is opposite the preceding E field (that is, the lines of force are opposite), an oscillating electric field is produced along the path of travel. When an electric field oscillates, a magnetic field having an intensity that varies directly with that of the E field is produced. 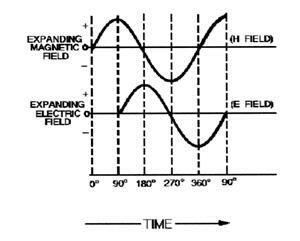 The variations in magnetic field intensity, in turn, produce another E field. Thus, the two varying fields sustain each other, resulting in electromagnetic wave propagation. During this radiation process, the E and H fields are in phase in time but physically displaced 90 degrees in space. Thus, the varying magnetic field produces a varying electric field; and the varying electric field, in turn, sustains the varying magnetic field. Each field supports the other, and neither can be propagated by itself. Figure 2-4 shows a comparison between the induction field and the radiation field. Figure 2-4. - E and H components of induction and radiation fields. The complete United States Navy Electricity and Electronics Training Series can be found at: http://www.tech-systems-labs.com/navy.htm Approved for public release; distribution is unlimited. The story of the investigation of light and the other electromagnetic radiations represents the work of brightest people, spans hundreds of years and is still a work in progress. The descriptions are often complex highly mathematical and almost impossible for most people grasp, but is at the same time fascinating and alluring for many including many radio amateurs. For myself, I like the humbling fact that despite building our modern technology and economy to large degree on the manipulation of electro magnetic radiation, when it comes to understanding exactly what in fact it is, there still remains some uncertainty and mystery! You will never look at your antenna the same again!